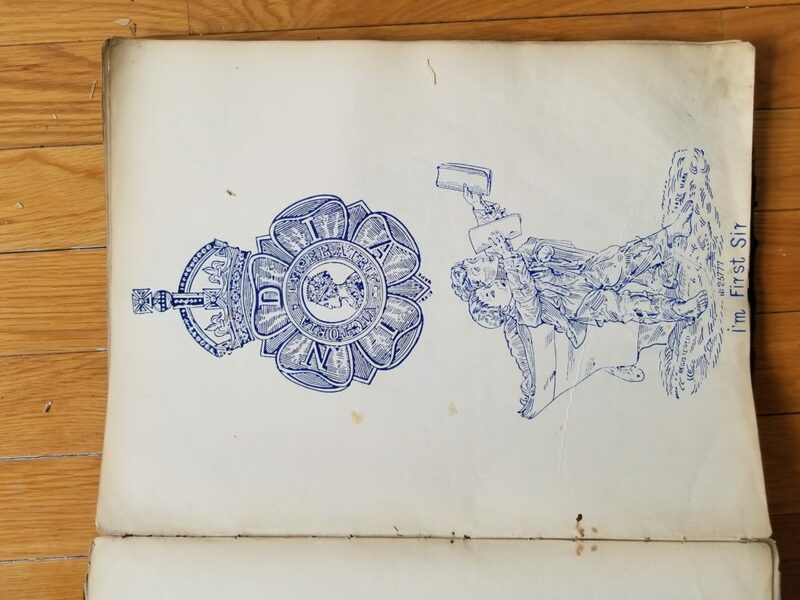 I recently purchased two rare books which were a record of the stamps held by merchants or fabric finishers. 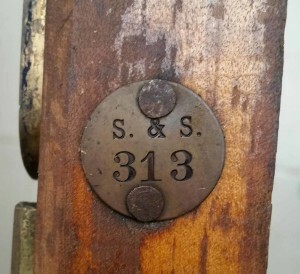 The stamps would be stored in shelves and each had a number on the side. 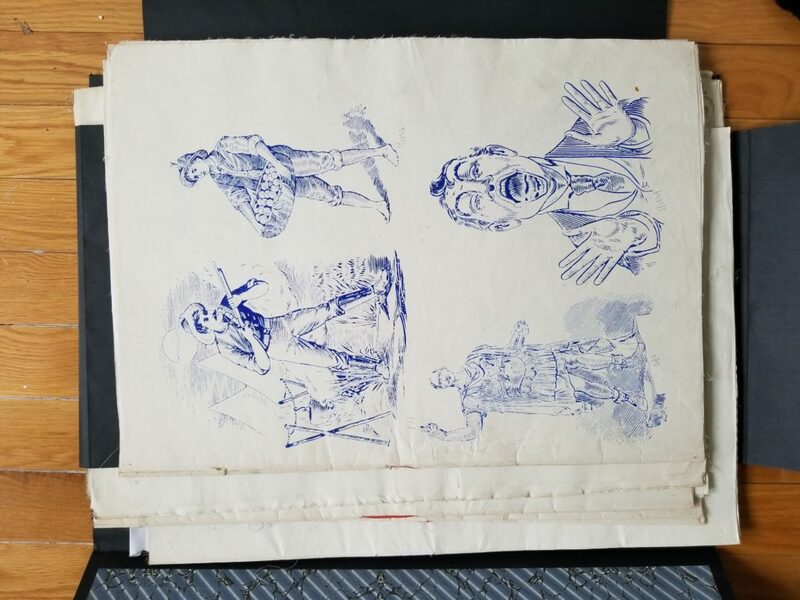 Using this book, the stamps could easily be identified and pulled off the shelf to print the front of cloth pieces to attract buyers in markets across the world. The River Etherow Bleaching book is in the foreground, which is an amazing stroke of luck as it goes with other items I have from there. 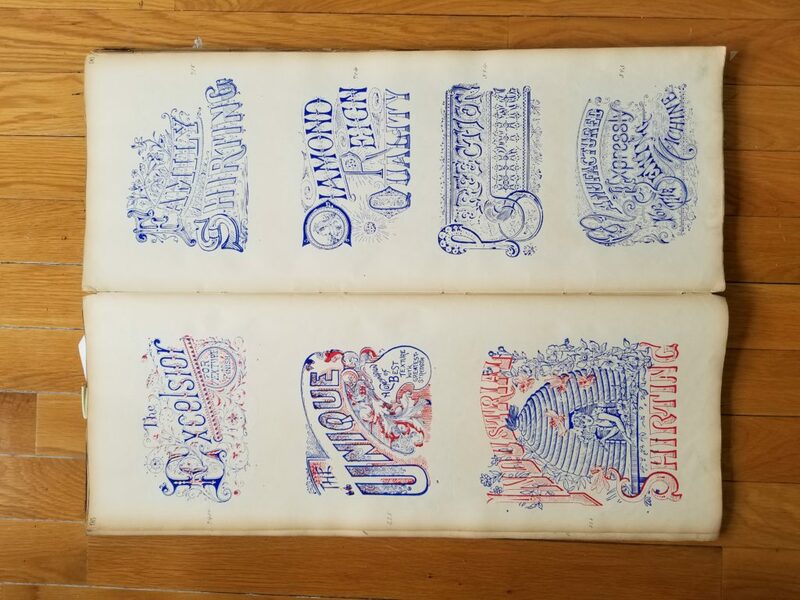 The other is from Buckley and Brennand Ltd., bringing my collection of these amazing items to 8 stamp books, containing thousands of original designs. The internet is an amazing thing, with billions and billions of pages. However, it seems that anyone who Googles for information on trademark stamps or tickets always ends up on this site! 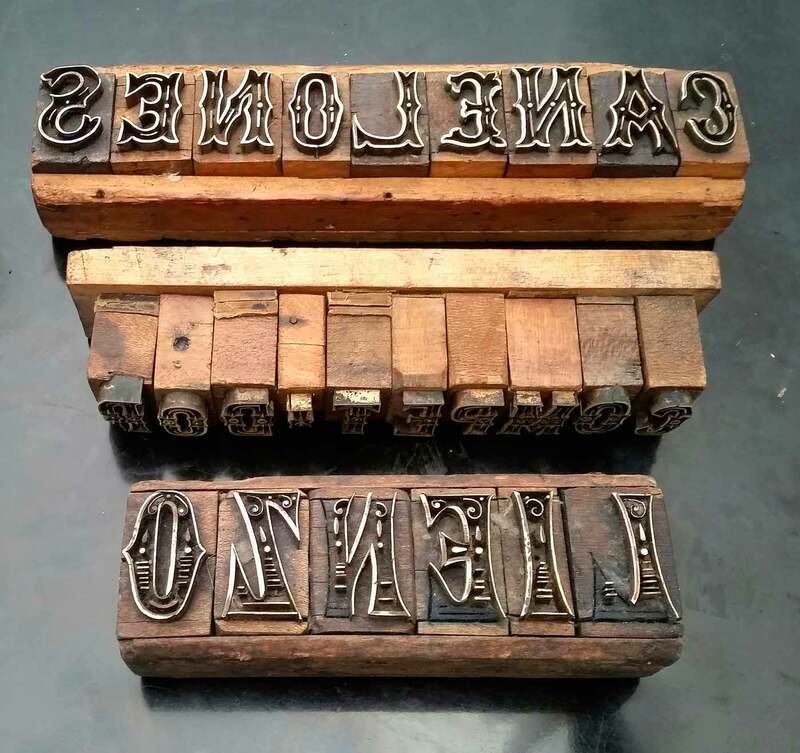 That’s exactly what happened when I got an email from someone who “found a few crates of stamps” while clearing out an old mill in Conestee, SC and, upon looking at some of the stampmakers’ names, found they matched the condor stamp I had purchased a couple of years ago. As this was really a unique opportunity to create a whole section of American stamps in my collection and stop them being sold piecemeal, I bought the lot. A few weeks later a pallet arrived with 6 large cardboard boxes containing 450lb of American stamps…. 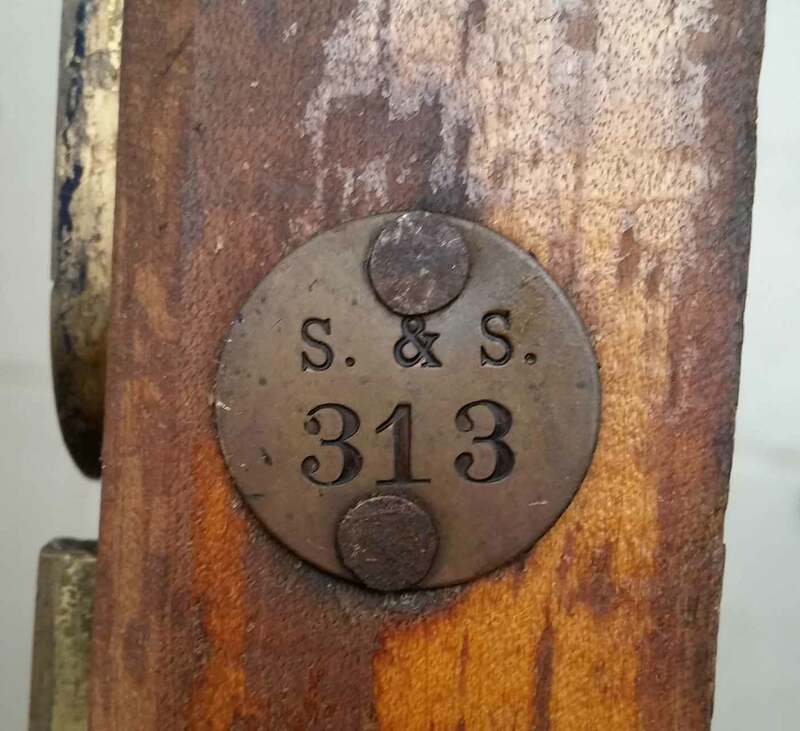 As I cleaned, fed the wood with linseed oil and then repaired (removing old nails and fixing bent metal) these forlorn objects, they revealed their history. 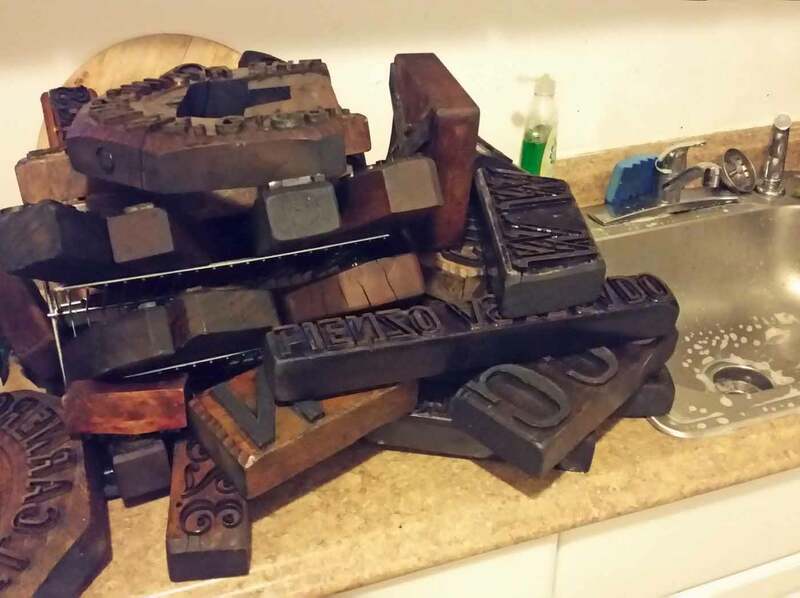 I always feel like I am polishing long lost gravestones when I go through this process and stampmakers’ names I had never heard of such such as Parsons & Mealey, Lowell, H H Manning, Lowell, Braidwood Stamp Co, Perth Amboy NJ, C J Kimbell, J Cosgrove RI, William Yungmann, 46 Beekman St NYC and F Brockman ( at both 607 W43rd st and 440 W36th St NYC) start appearing from beneath years of dirt . The names of merchants who owned and marked their names on the stamps such Neuss Hesslein (Nehesco), Suffern & Suffern, Garner & Co., Watts Stebbins & Co., J A Doering, Hayward & Thurston, Ultramares Corp, Shall & Co., De Sola & Henriquez, San Salvador, A D Straus & Co, Hispanic Textile Co will all help in dating the stamps. 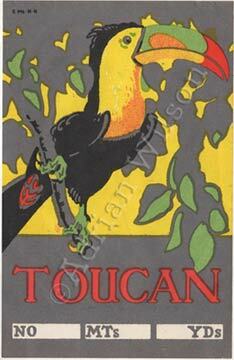 What I do know already is that the condor stamp originated from this same collection. 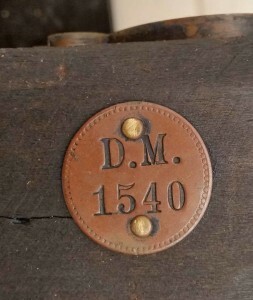 It has exactly the same “D.M.” badging that can be found on some of these stamps. 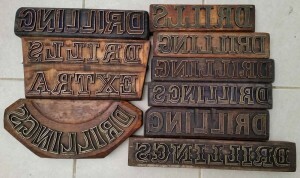 I was told that the collection was amassed from different mills as they closed down over the years. “Clifton Mills” appears the most and was originaly built in the 1880’s in Clifton SC. 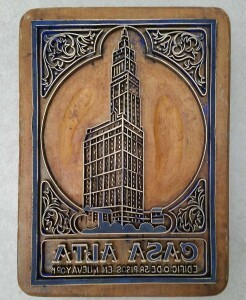 But there are stamps from other locations and companies such as Nutwood, Castleton, Adsco Mills, The Rising Sun Mf’g. 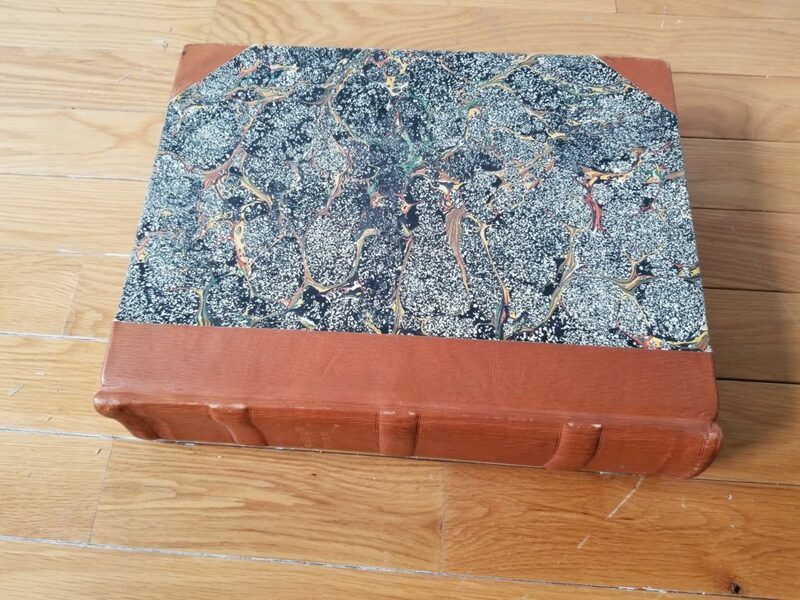 Co., The Callerton Mf’g Co. and Barnard which I need more time to trace the history of online. 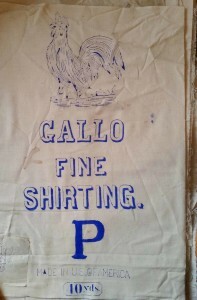 The fabrics most often mentioned on the stamps are Sheeting, Drilling and Shirtings. 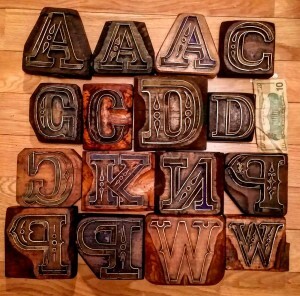 After going through this collection, I would say that the American stamps match the English ones both in construction technique and standard height but the design and execution is definitely ‘good’ rather than ‘high’ quality. Of course, what tends to happen with these collections is that all the best stamps are sold, leaving only the less attractive ones to gather dust as happened here. 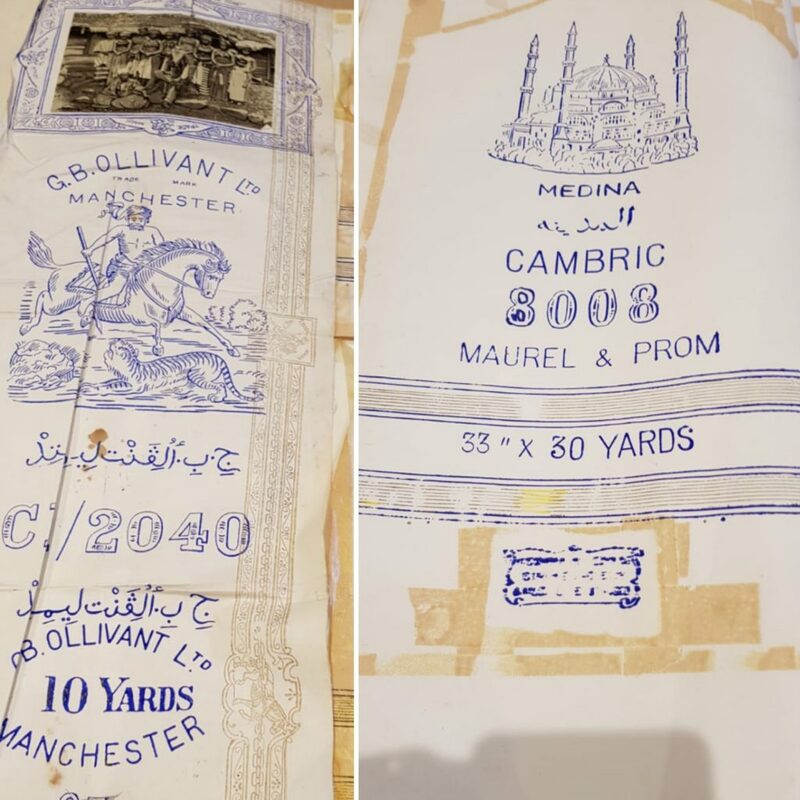 Despite the cherry picking, the missing pictorial stamps that are printed on the bolt cloth samples pale in comparison to those made by their Manchester counterparts. 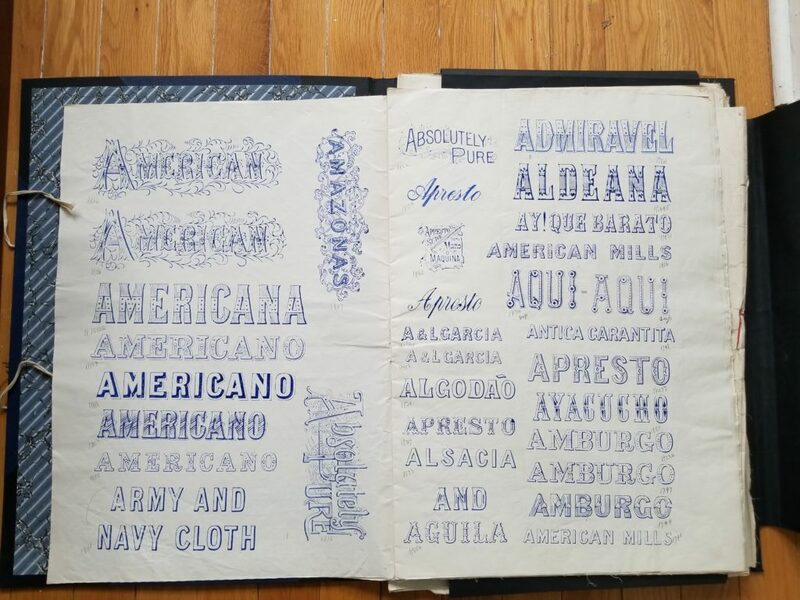 That makes sense because the American fabric trade was not as competitive and just focused more on cheaper fabrics (such as the aforementioned sheeting, drills and shirtings) for the domestic and nearby South American markets. As competition was less fierce, high quality distinctive branding between merchants was therefore not as important as in the Manchester trade. 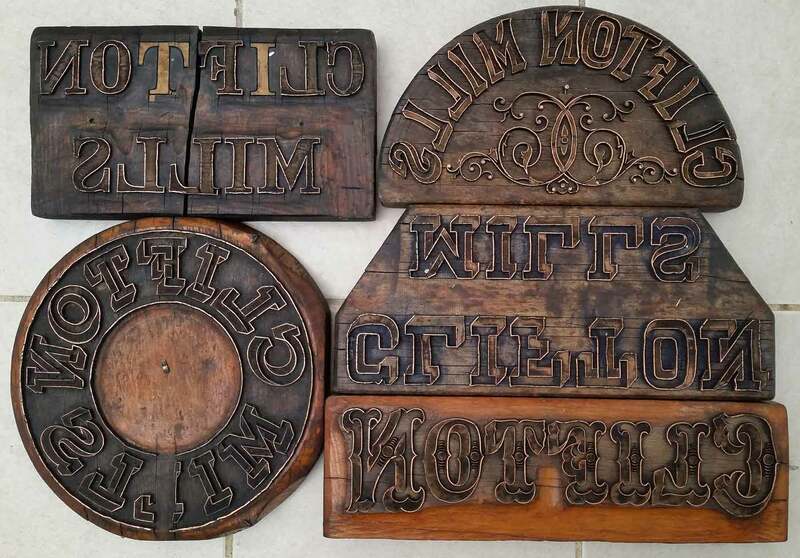 As much as I am spoiled by already having such a huge collection, these hand-made possibly 100 year old American objects are still an incredible and beautiful find. 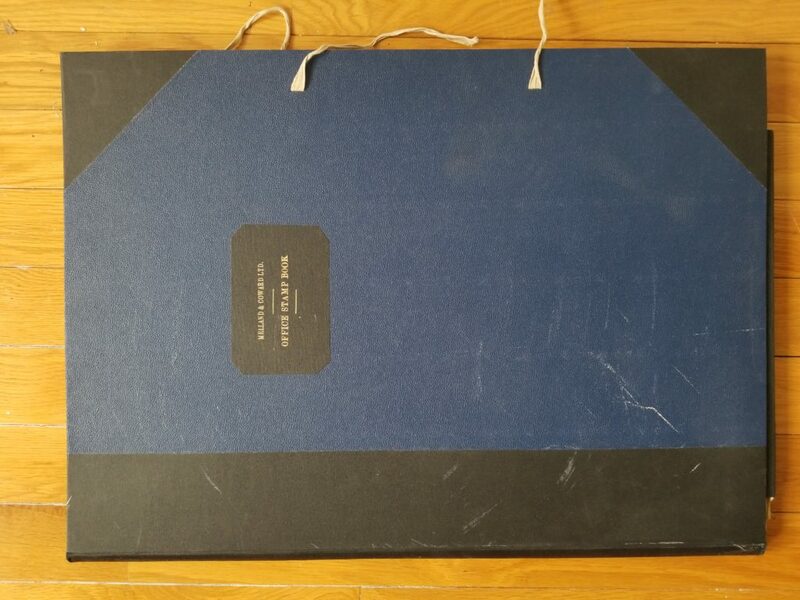 I feel so lucky to be in a position where people offer me things like this after seeing my enthusiasm for collecting and preserving on this website. Who knows what else is out there….? 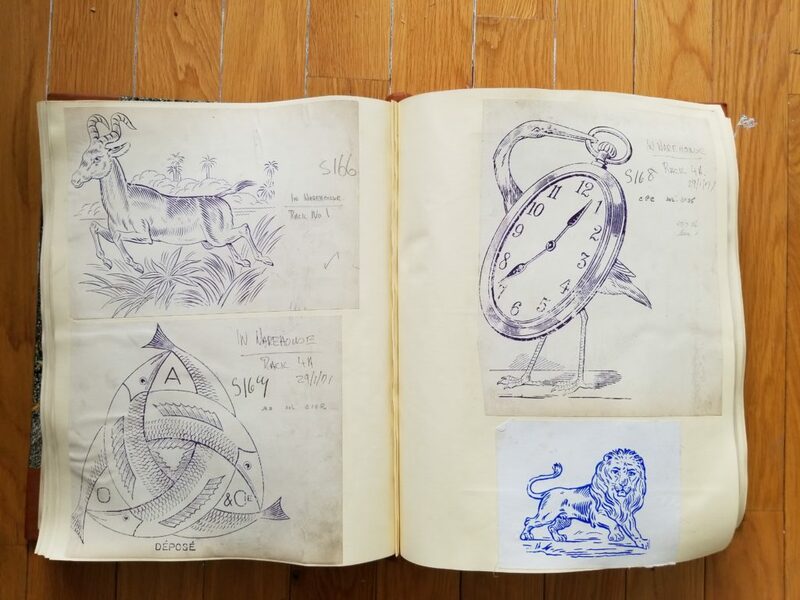 I am happy to hear from anyone with anything from objects to memories regarding this fascinating subject. While you are here, please remember to be respectful and not copy any of the text or images on this site without my permission. I am always happy to share information but just consider how much time and money goes into bringing this information for you to enjoy before copying and pasting anything. Thanks! 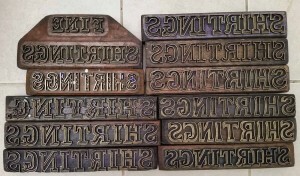 One of the delights of this website is being contacted by those who have some personal link to the stamps, tickets and textile trademark business. The power of the internet, combined with serendipity, never ceases to amaze me. 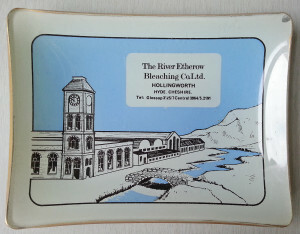 I bought two stamps a while ago from an ex worker of the River Etherow Bleach works and as a bonus, he gave me a company ashtray depicting the textile mill. 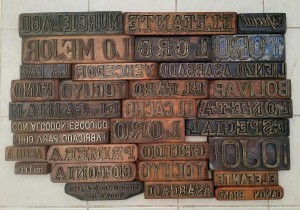 I posted it online, along with the stamps. Lo and behold, I received an email a short while later from Brian Midgley, who proudly stated that he “worked in the engine house and had a bit of a talent for drawing, so the company used my picture for the ashtray.” Adding “I was 20 and they paid me five pounds and gave me two ashtrays for my drawing.” As someone who worked tending mill engines his whole life, he couldn’t believe his ashtray was on the internet. We emailed and chatted for a while, so when I went back to England last month, I met the now 69 year old engineer and one time artist, and he gave me a set of photos he took of his family. 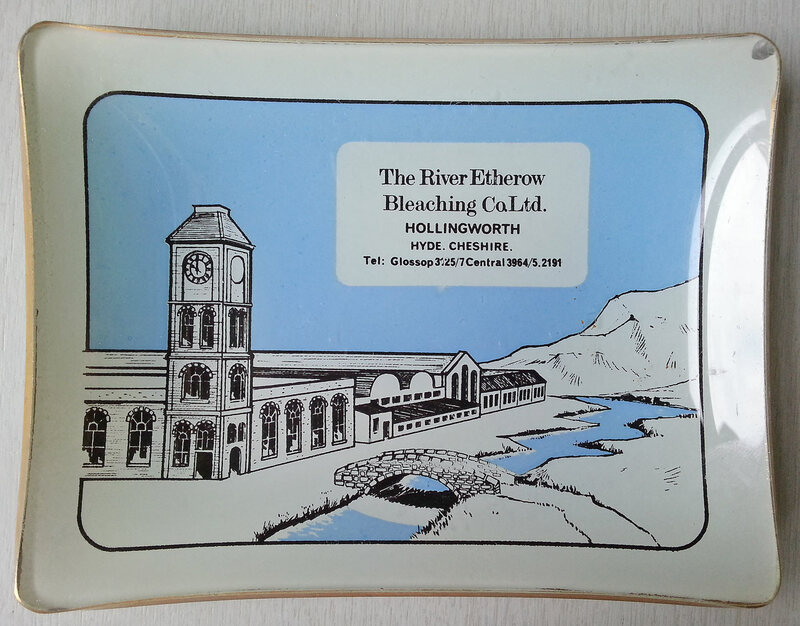 So here is a pictorial history of the Midgley family’s long working association with the River Etherow Bleaching Company. These images are all Brian’s copyright and must not be used without permission. 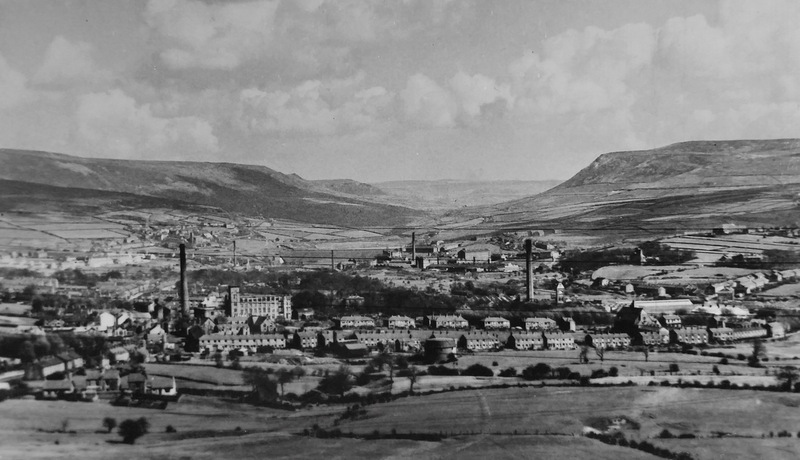 This is the view of the Mill, on the right hand third of this photo of the Longdendale Valley. 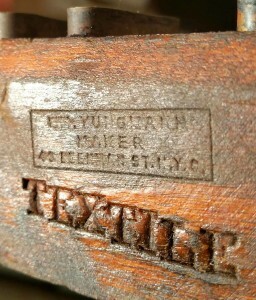 Here is a close up of the mill itself. Note how they removed the top of the tower on the ashtray illustration for some reason unknown to Brian. 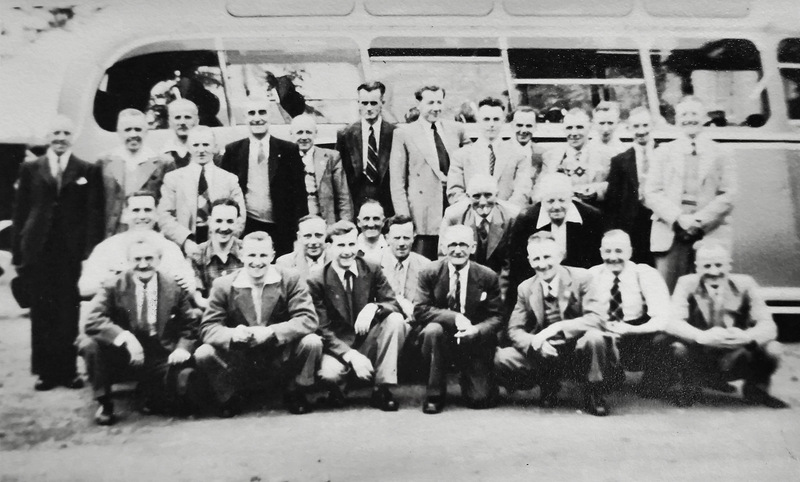 This is Brian’s grandfather, George Midgley (first on the left), who was an “ash wheeler” for the hopper fed Lancashire Boilers that they are stood beside. 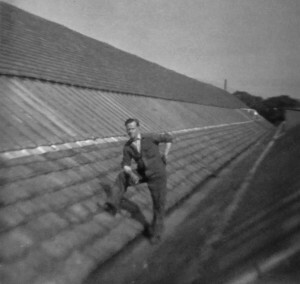 And this is Brian’s father, George Midgley, who was the factory “Yard Man” (bricklayer and labourer), working on the factory roof. This is Brian’s mother, Enid Midley (in centre), who worked in the Making Up room and can be seen here tying the ends of each cloth piece together before it was stamped. In the background are the folding or “Plating” machines. It wasn’t all work and no play. 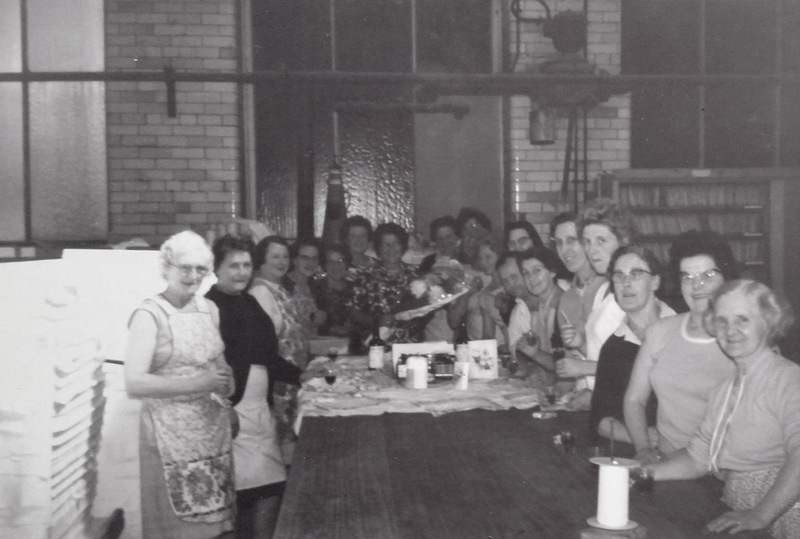 Here is Enid enjoying her birthday celebration with her workmates, photographed by Brian. 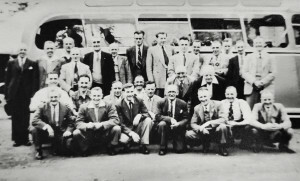 John Revel, who had lost his legs in a train accident but worked at the mill; Walter Jackson, Electrician; Ronnie Clayton, Foreman Joiner who ended up Works Engineer; George Wilson, head of Wages Office; Thomas Cooper, Brian’s cousin who was a labourer; George Midley, Yard Man; Fred Goddard, in charge of Water Treatment and John Goddard who was the “Oiler & Greaser”, or Grease Monkey. Last but not least, Brian wanted me to have this medal. 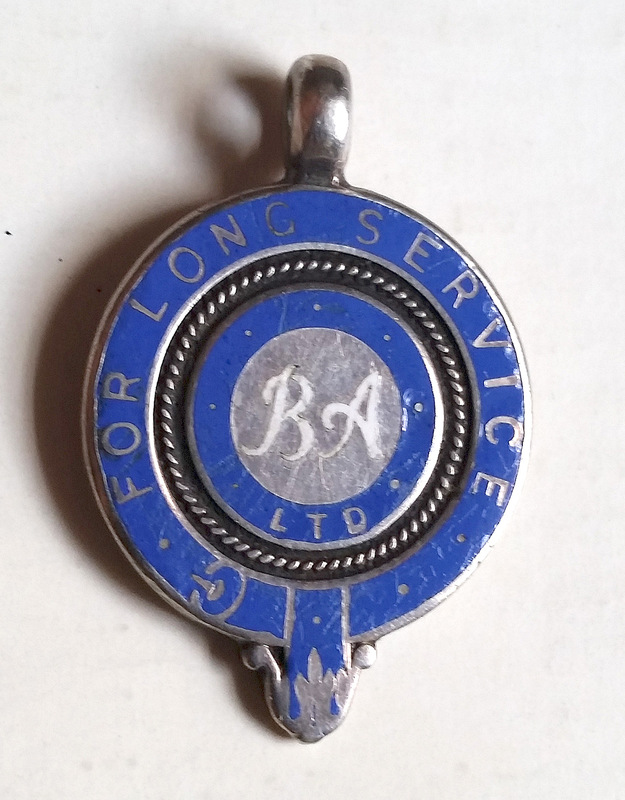 It was given as recognition for long service to workers in the Bleacher’s Association and I will always treasure it. It is amazing that all this came from posting a photo of an ashtray on the internet. I am very happy to be able to share the artistic photos and the obvious pride Brian has for his family. 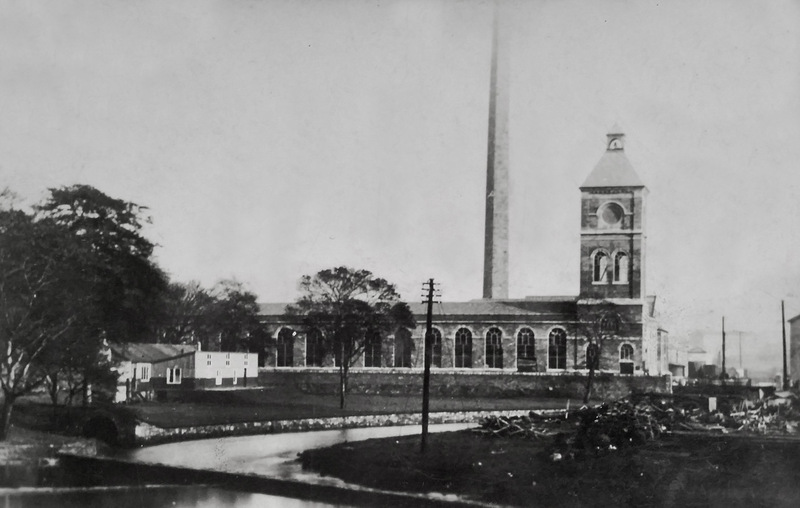 The factory is still there, though no longer bleaching cotton, and now part of its human story has been brought back to life thanks to Brian. I thought it about time that I had some of the Chinese tickets translated. 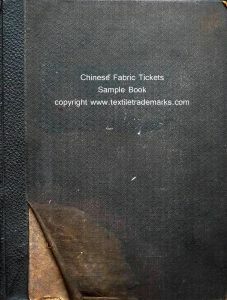 The style and printing of tickets, or “Chops” as they were often referred to, was designed to replicate the silk paintings that were familiar to Chinese buyers. 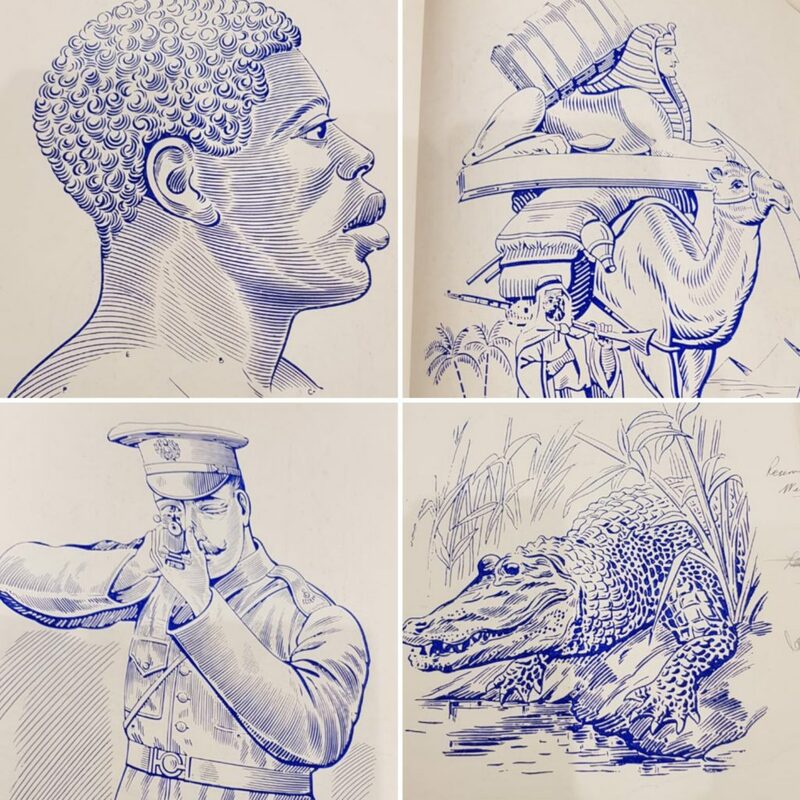 China was a huge market for the Manchester textile trade and the diversity and care of how the trademarks were chosen was no different than that for the Indian or African market. To a western eyes that do not know the fables or spiritual references such as myself, the images can often look repetitive and indistinct. However, on having just a few tickets translated in the following (flash based) ebook…. 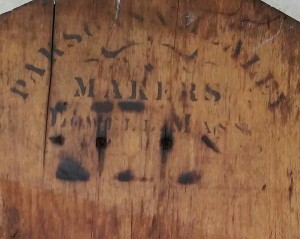 …it becomes more obvious that symbolism – such as a pearl in an oyster signifying a baby boy for instance, and locally recognizable figures such as warriors from stories, or Thunder Gods from fables again proves that Manchester merchants knew exactly what images would attract buyers to their particular brands. The ticket book dates from around 1910 but the designs may have been created years earlier. 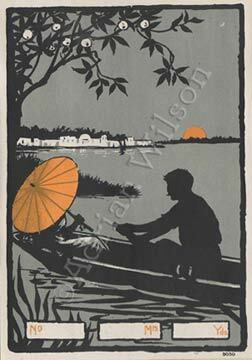 I have no doubt after seeing original artwork for these tickets, that Chinese artists would have been employed as ticket illustrators by the big printers (B Taylor employed 20 full time artists) in Manchester, rather than train Western artists to draw in a Chinese style. 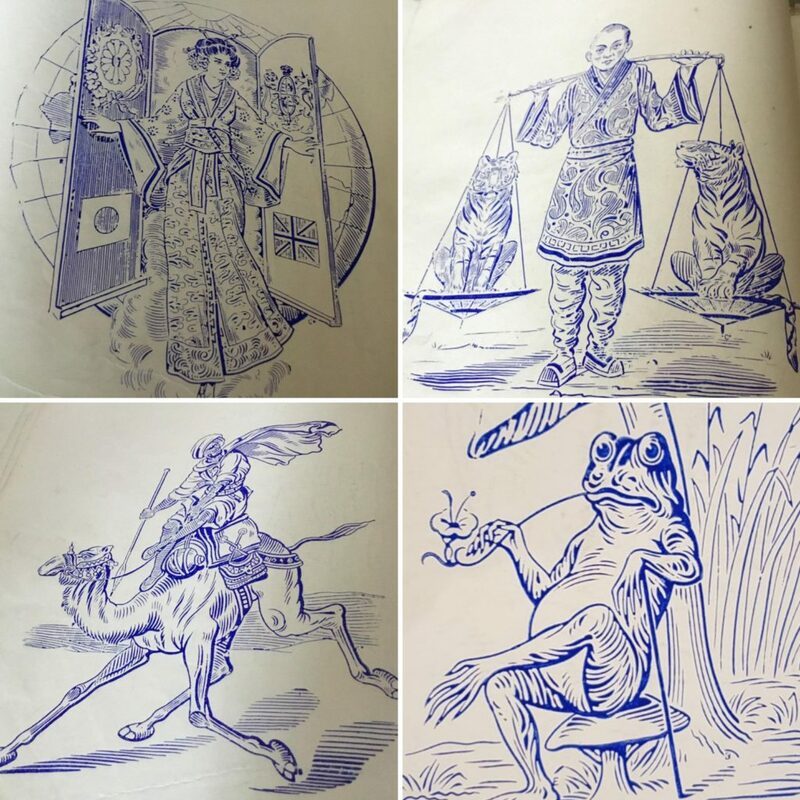 The ideas for the designs would have sometimes been suggested by the Chinese fabric importers and merchants, or by the agents and salesmen of the Manchester merchant firms, to ensure their local relevance. 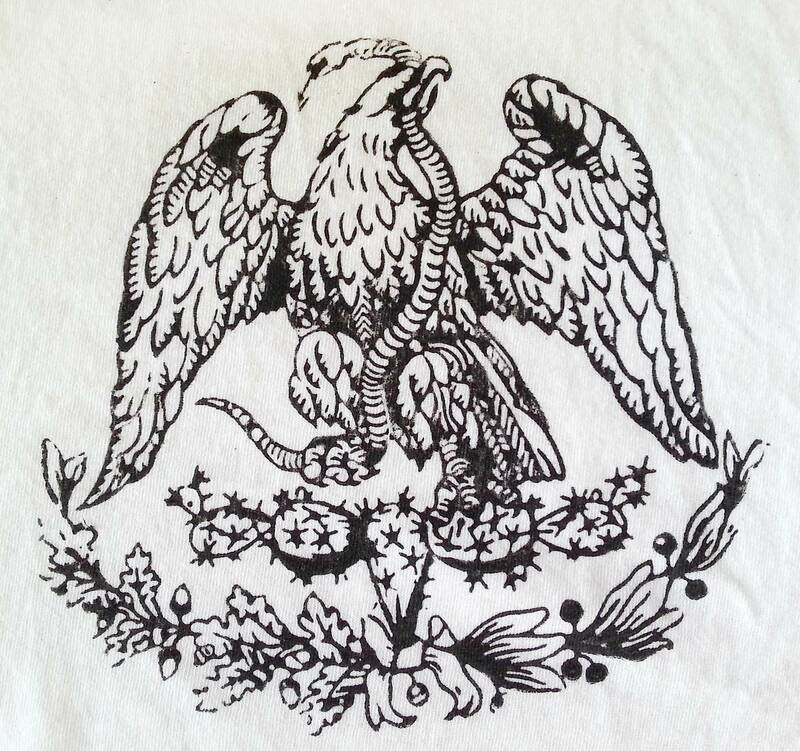 The coat of arms changed over the years and this design, by José Mariano Torreblanca, was used from 1823-64 and then from 1867-93, so the stamp was made during one of these two periods. 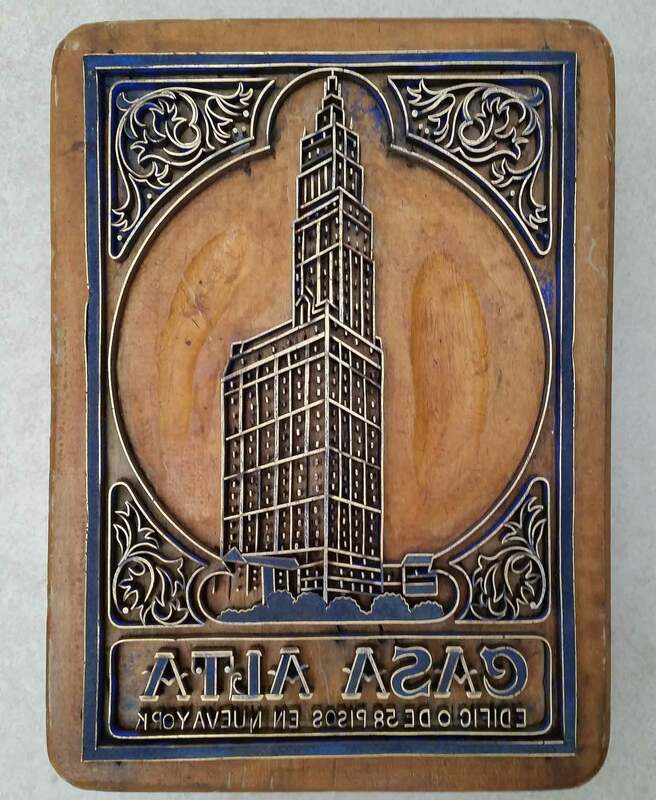 The stamp was made by J Cosgrove, Providence, R.I. and a Census lists a John Cosgrove working as a stencil cutter (The American term for a stamp maker) in Providence in 1880. This is where things get interesting. The census lists John Cosgrove as being English, born in 1833 with an English father and an Irish mother. 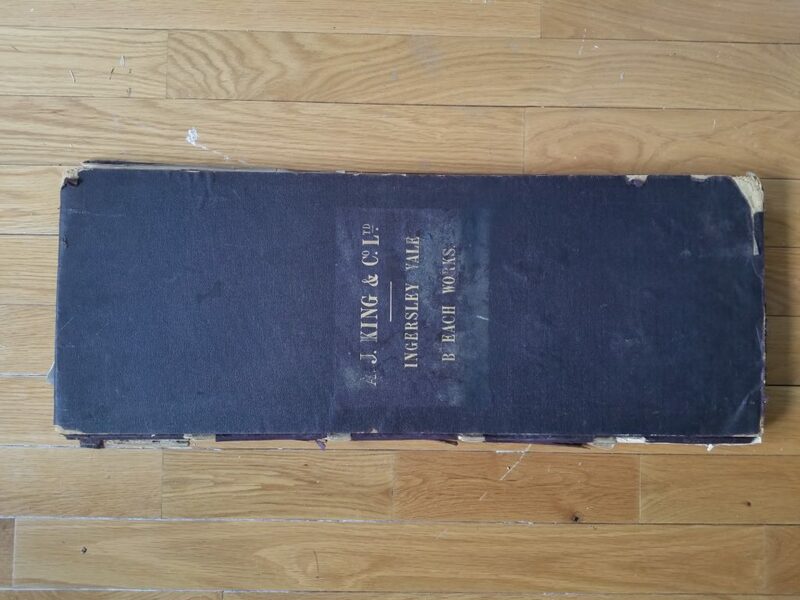 Searching for a John Cosgrove who was born in England in 1833……. 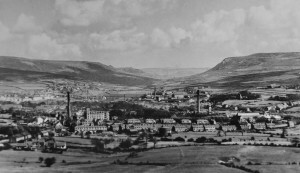 A John Cosgrove, born in Lancashire in 1833, was listed as living in Manchester’s Ancoats textile district in 1841 and 1861 censuses. In 1880 the USA census states that his son and daughter was Irish and the youngest was 17, which means they must have moved to Ireland at some point. They must have left for America before 1868 because his daughter Alice was born in Massachusetts. 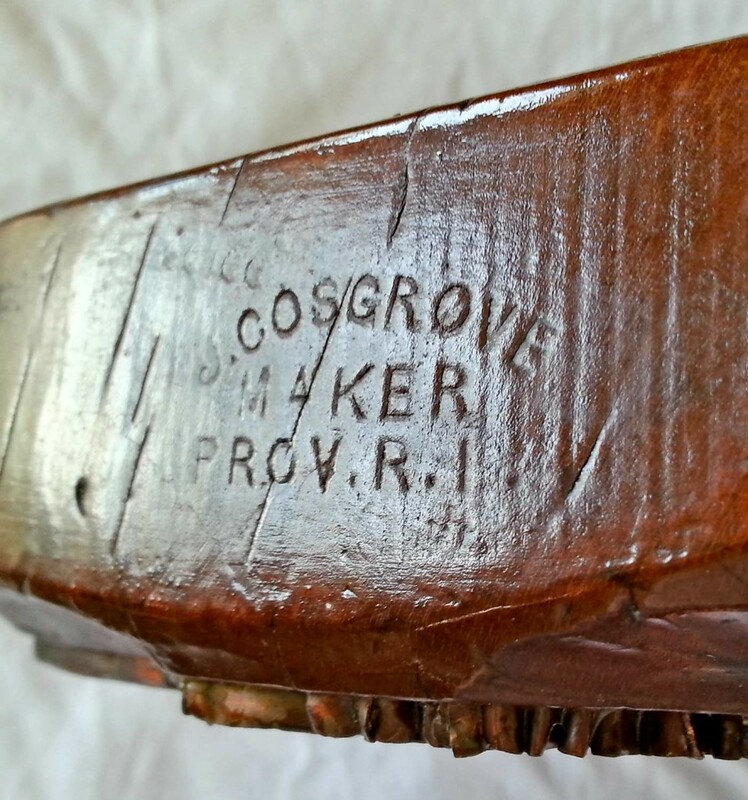 There is a Thomas John Cosgrove who married a Sarah Mcmullon in 1859 (When John was 26) in Carnmoney, 7 miles from Belfast – the only ‘Sarah’ to marry a Cosgrove in that 20 year period. He is half Irish so he could have gone to Ireland to get married and moved there just after the 1861 Manchester census, having babies Matilda and Albert (in 1862 and 1863) in Ireland. He probably learned his stampmaking trade in Manchester and then moved to Belfast. 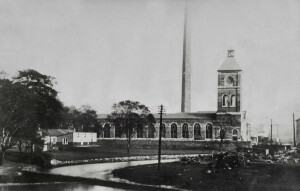 Between 1861-65 there was the “cotton famine” because of over production and a restriction where they couldn’t get cotton from America because of the civil war so many Manchester factories shut down, so it would make sense to move to Belfast where the Irish linen trade was based and much less affected. 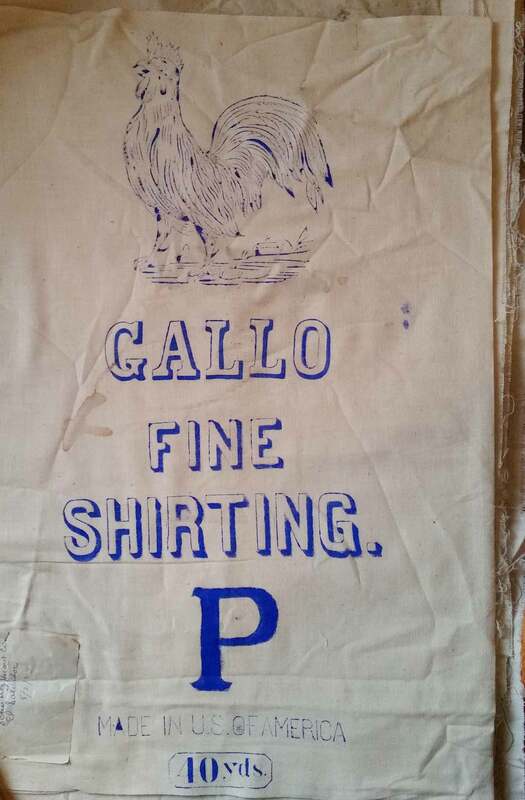 There were linen trademark labels so I am presuming there were Irish trademark stamps being made in Belfast too. The alternative is that he married Sarah when she already had children born in Ireland and went straight from Manchester to America, though that seems unlikely as his children are all listed as having an Irish mother and English father. 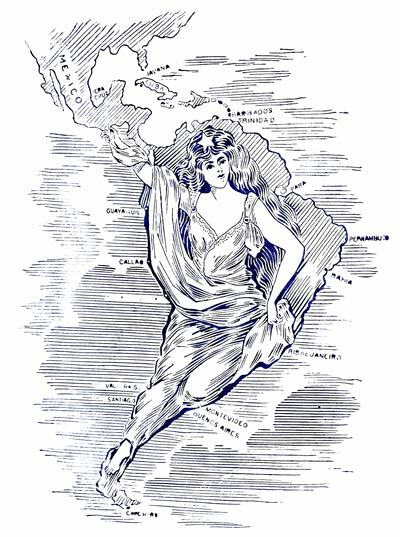 They emigrated at some point after 1863 and had their daughter Alice in Massachusetts in 1868. 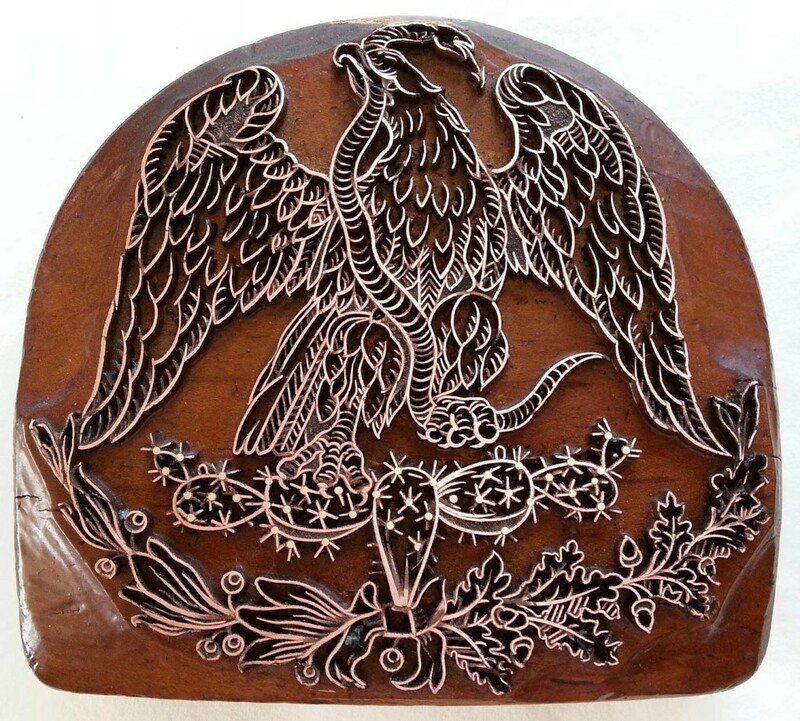 The family then made their way to Providence, which was the centre of “Stencil cutting” in the Northeast. 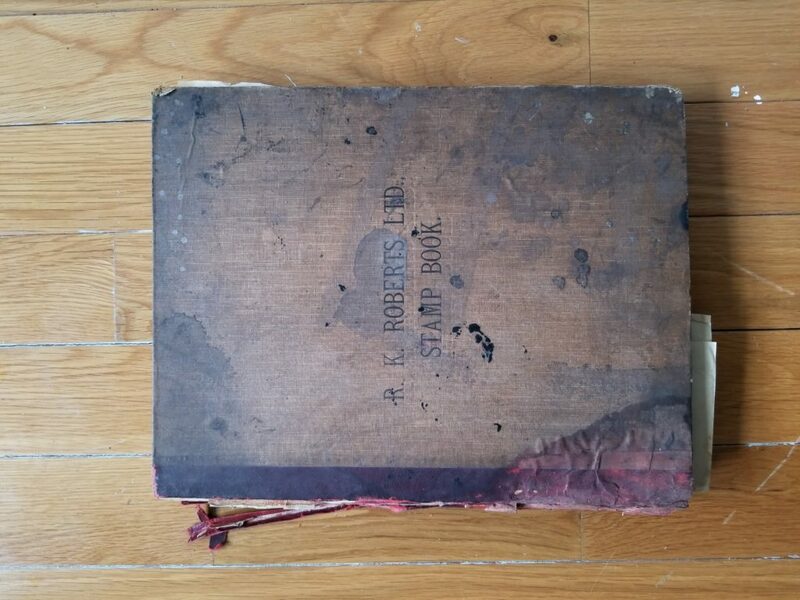 It is interesting that Albert was following his father into the stampmaking trade. 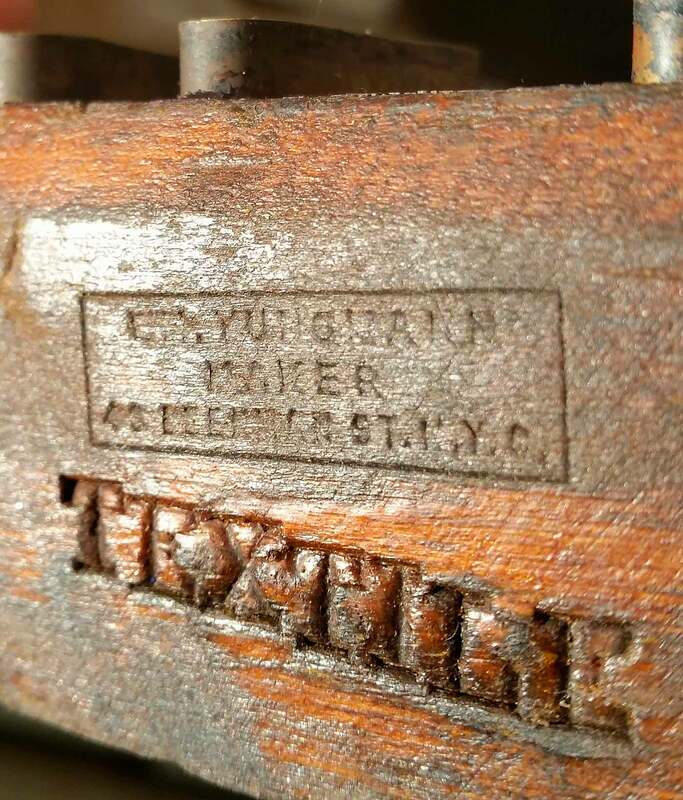 So what this single stamp has showed is that there was a direct link between Manchester stampmakers and American Stencil cutters. 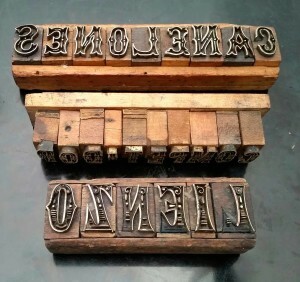 The stamps are identical in dimension and construction techniques. 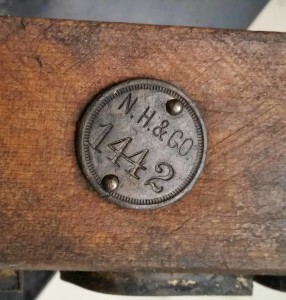 The reasons why John Cosgrove moved from Manchester to Providence via Ireland will probably never be known but putting his name on the side of this stamp for the Mexican market has revealed a wealth of information about the trade and the Cosgrove family history. The stamp itself would have been made no later than 1893 because the Mexico coat of arms changed in that year but cannot have been made before 1868 because John Cosgrove lived in Ireland at that point. 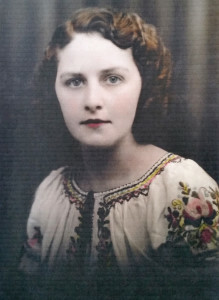 If anyone wants to add any more information, such as finding information on John Cosgrove’s father, the date when the Cosgrove family emigrated to America, or what happened to the Cosgrove children, I would love to hear from you. 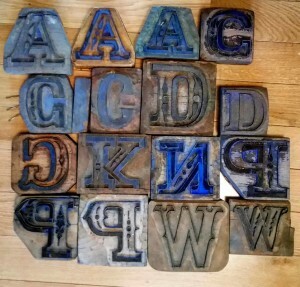 Thanks to this site, a reader from Yorkshire, England contacted me to sell his collection of letter and number stamps, which doubles the size of my single character collection.They were in trays and random but have been since sorted and I share them here with you. 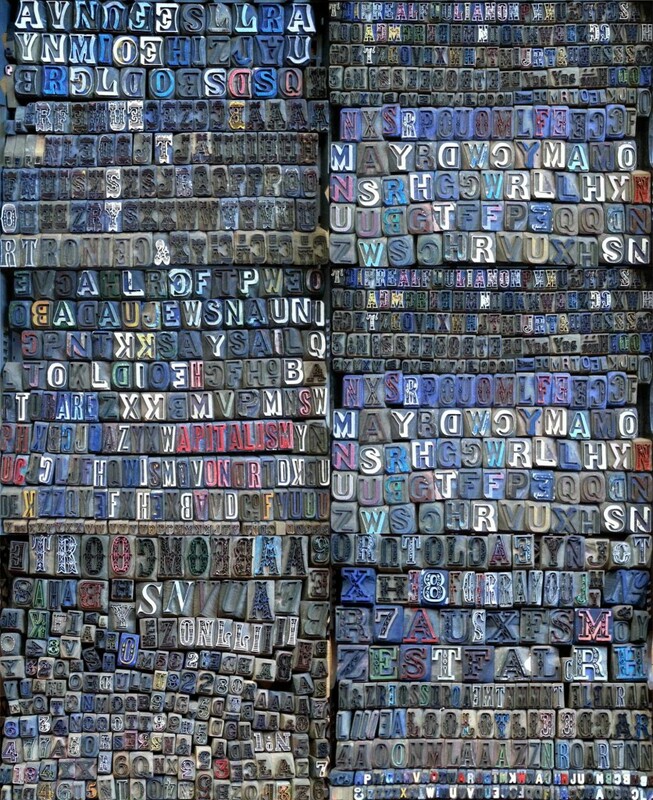 Below is my existing collection of numbers and letters, with several complete alphabets. 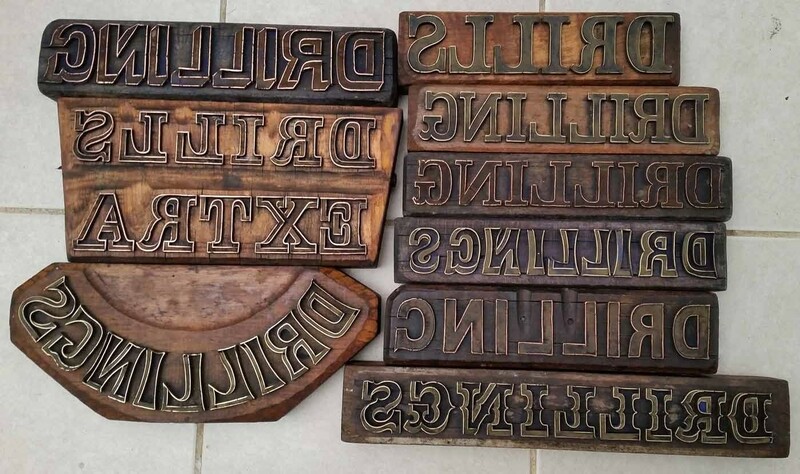 I hope some of the random spare letters match some of the fonts from the new collection. 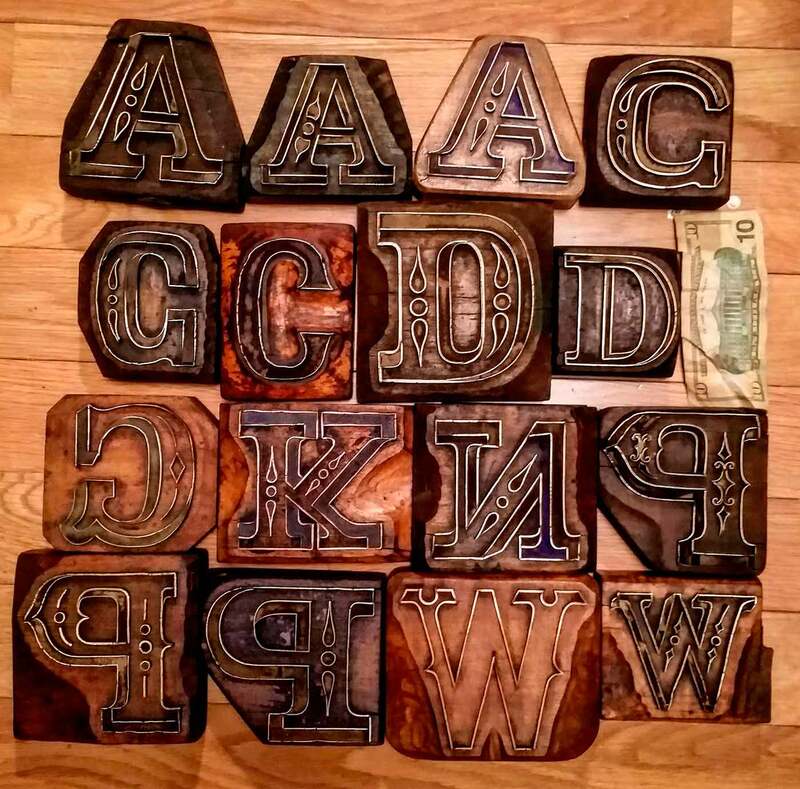 I also wonder if missing letters could be made using a 3D printer? 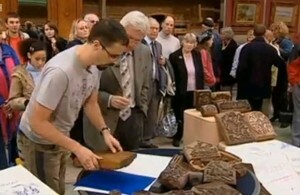 This is my appearance with samples from the collection as a special collector guest on the BBC Antiques Roadshow when it visited Manchester, England. 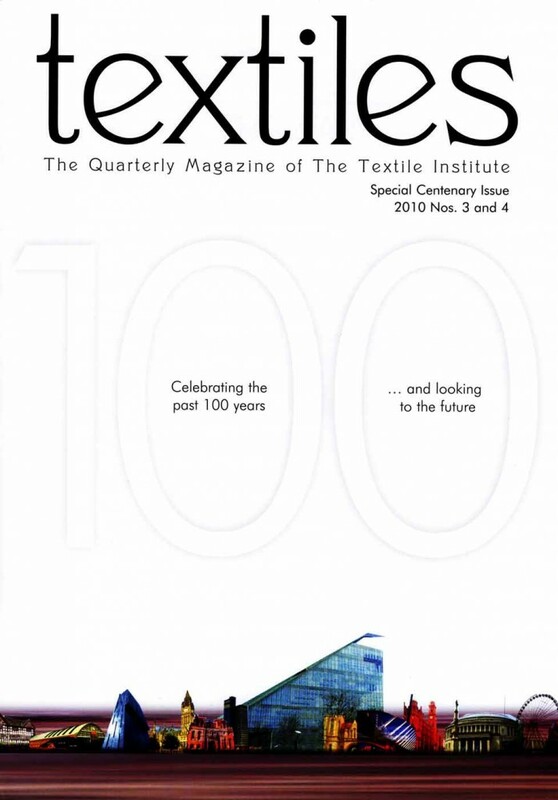 I was very proud to have been asked to write a six page article for the Textile Institute’s 100 year anniversary commemorative magazine. 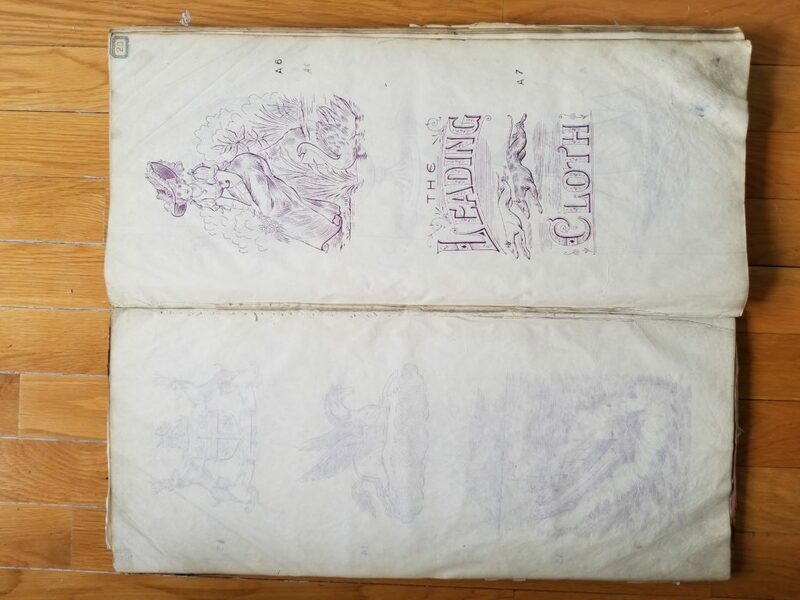 The Textile Institute is one of Manchester’s most venerable organizations with a long history central to the cotton trade, so to see the trademark artist’s skills recognized in such a way is an honor to their previously overlooked talents. Back in 1987, I was starting out my career as a photographer in Manchester, England and needed a cheap studio. Although I didn’t realize at the time, by renting a room in an old fabric packing warehouse, I would be the last in a 100 year span of individual businessmen who would work from that office. “Asia House” was at 82 Princess Street and was typical of the area, with its ornate frontage and lavish marble and tile entrance. More importantly, the late 1980’s was a time when the fabric trade was all but gone, the merchants were closing down and the developers were starting to turn the buildings into apartments. Granby Row and India House were the first conversions and today, most of the old warehouses are either hotels or apartments. When the merchants left and the interiors were stripped of their mahogany counters, oak panelling and ornate tiled stairwells in favor of clean modern lines, everything was dumped. 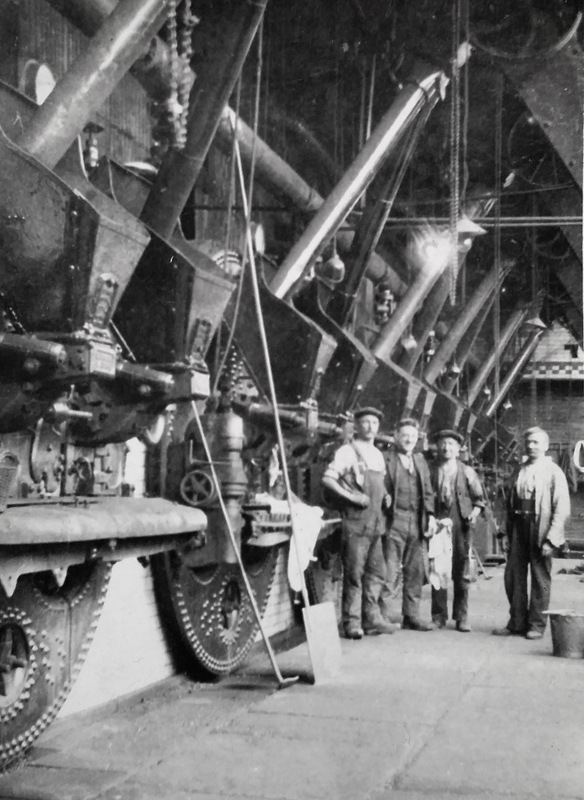 Demolition crews would take out the elevators and bulldoze everything down the empty shafts. By this time, a warehouseman by the name of Steve Bates had given me a bag of old stamps because he knew I liked antiques and he thought it a shame they were being thrown out. This gift was the spark which ultimately led to the collection as it is today. I started visiting all the merchants who were still in business and asking if they had any trademarks they no longer wanted and spent hours working alongside the demolition crews to rescue objects before they were dumped. The demolition guys were happy to see things saved and I became so well known that they would keep interesting objects to one side for me. I could see there was a whole unknown history of Manchester literaly going down the chute, so anything I thought would be of interest, or I had duplicates of I donated to the Museum of Science and Industry in Manchester. 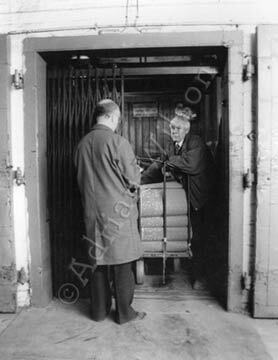 By the time I left Asia House, my office was furnished with everything a Victorian merchant used in their trade. That whole office is now on display at the museum after I pitched the idea of showing the merchant side of the fabric trade for the first time to one of the museum curators for their new Textiles Gallery. 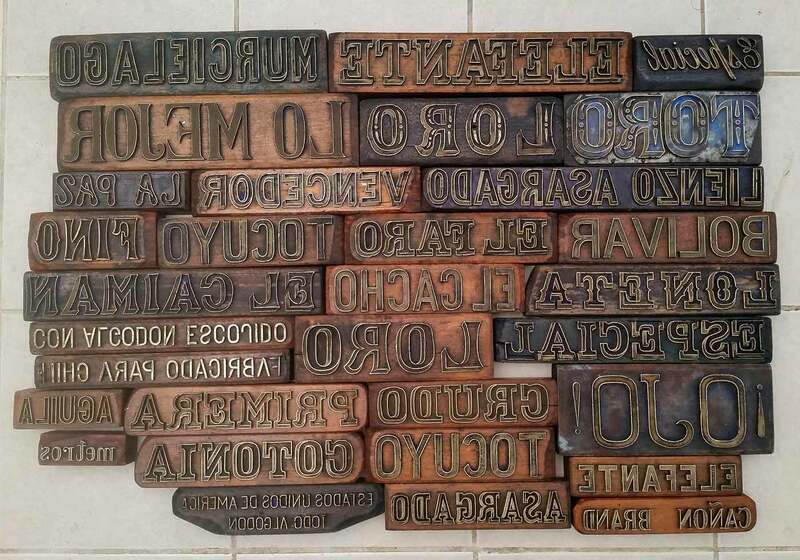 Anyway, back to my own rummaging and I came across a large collection of stamps and labels when a company called Spruce Manufacturing of Sackville Street was taken over by a larger fabric company. 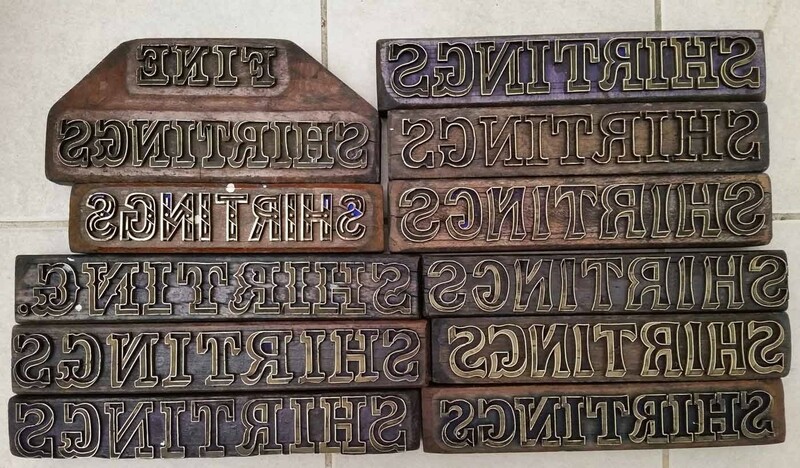 Steve Bates put me in touch with the company and I ended up buying their collection of labels and about 650 stamps from their African and Persian Trade. 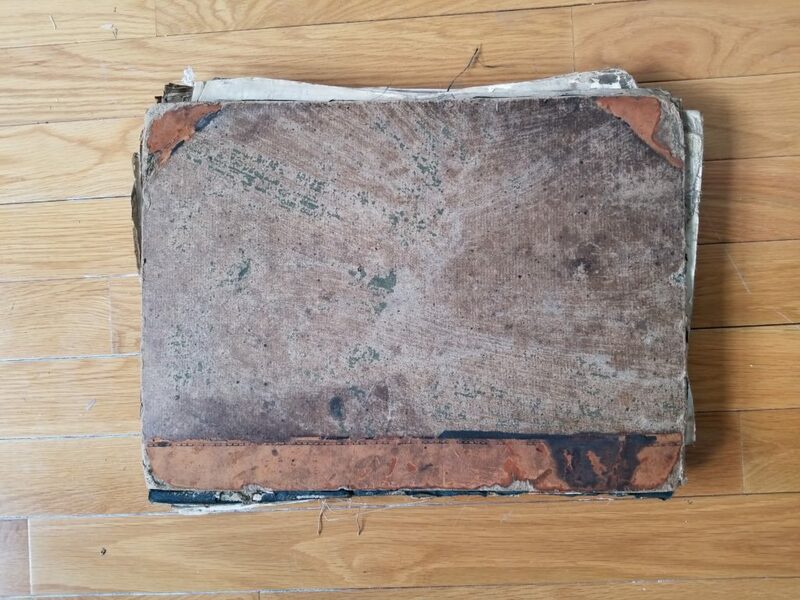 It wasn’t just about trademarks as I rescued lots of company archives before being destroyed. 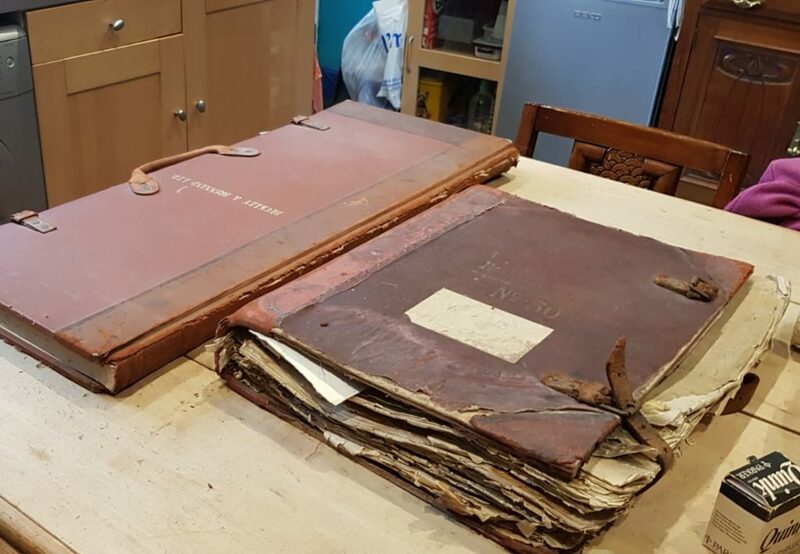 A company by the name of R.A. Hamwee had long since gone but a lot of their paperwork had been abandoned in the loft space of Beaver House and provided a great deal of useful information on how a merchant business worked. 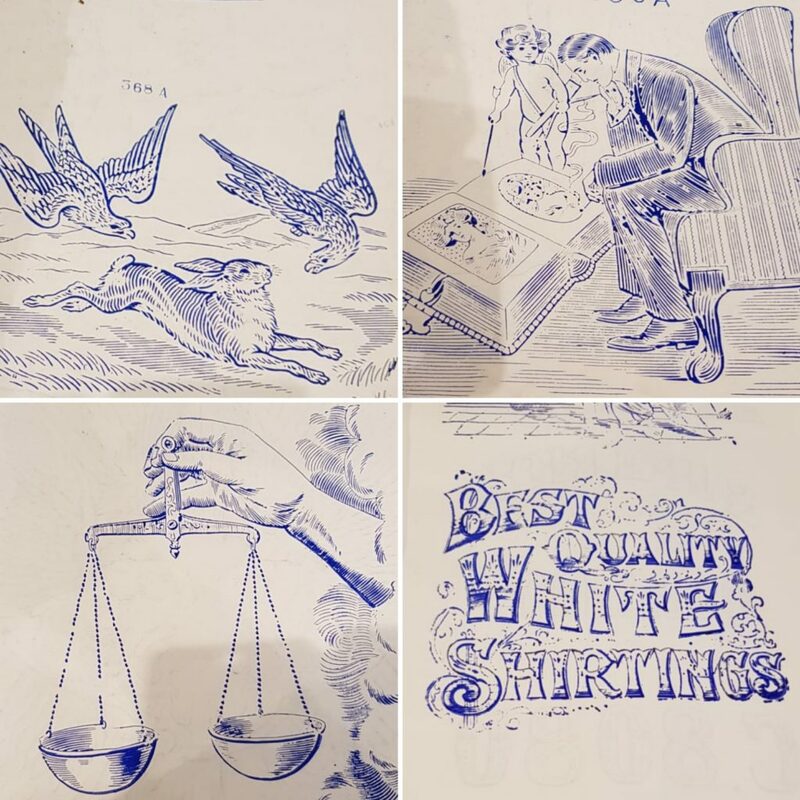 I even found the original hand painted architects drawings for the warehouse, detailing how each floor was laid out to receive, inspect, stamp, bail and despatch the fabric. 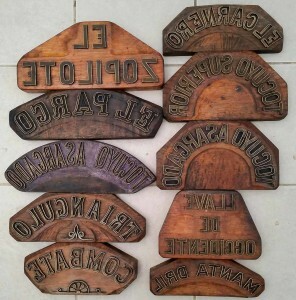 The other large collection I acquired was that of Stavert Zigomala. 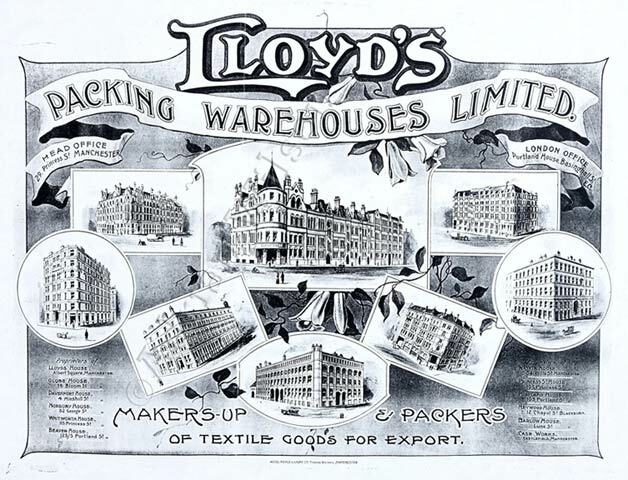 This company was incredibly old, dating back to the 1810 period and had links with the Jute trade in Dundee, the cotton trade in Glasgow and the wool trade in Bradford. 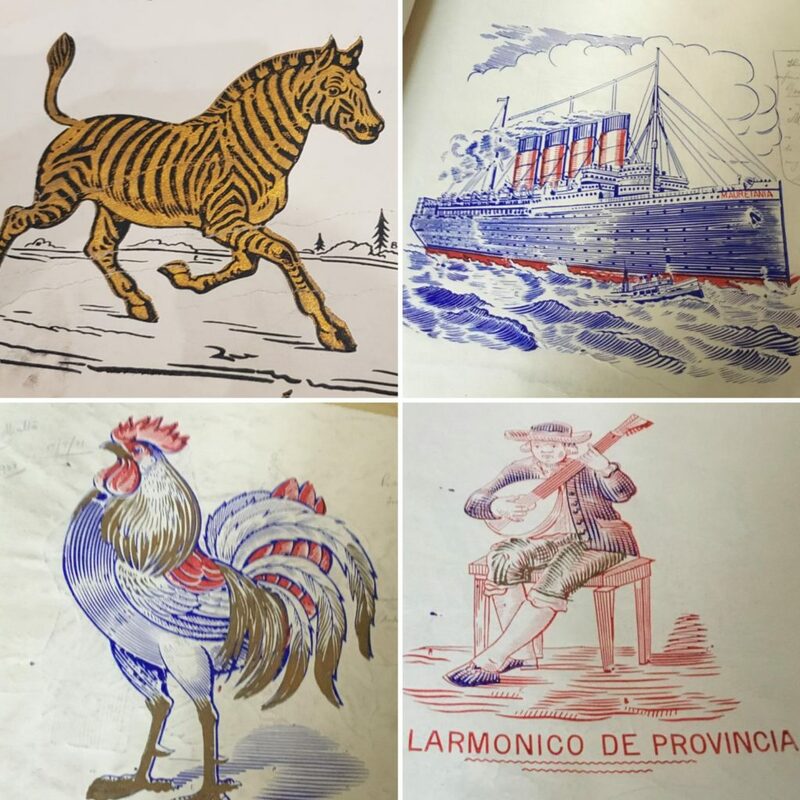 They exported to Central and Southern America and their complete company archive plus collection of 2,500 stamps and fabric samples were kept at the private house of the last descendent of the family who owned the firm. He was in his 80’s but I spent every Saturday morning visiting this character, who told me how his father owned the company, yet he still had to spend years working his way up from the bottom of the firm so he could learn all aspects of it. He knew everything and loved the fact I was trying to preserve the history, ultimately giving his version of it to me on audio tape. 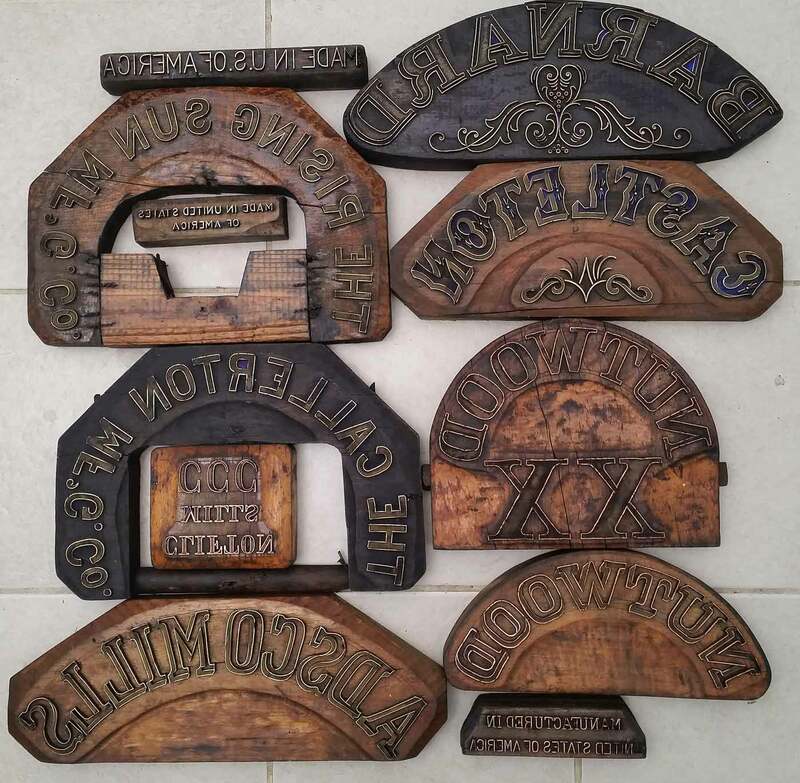 Every week I would take a box of the dirty stamps from his cellar, wash them and feed the wood linseed oil, then take a paper print of the design. 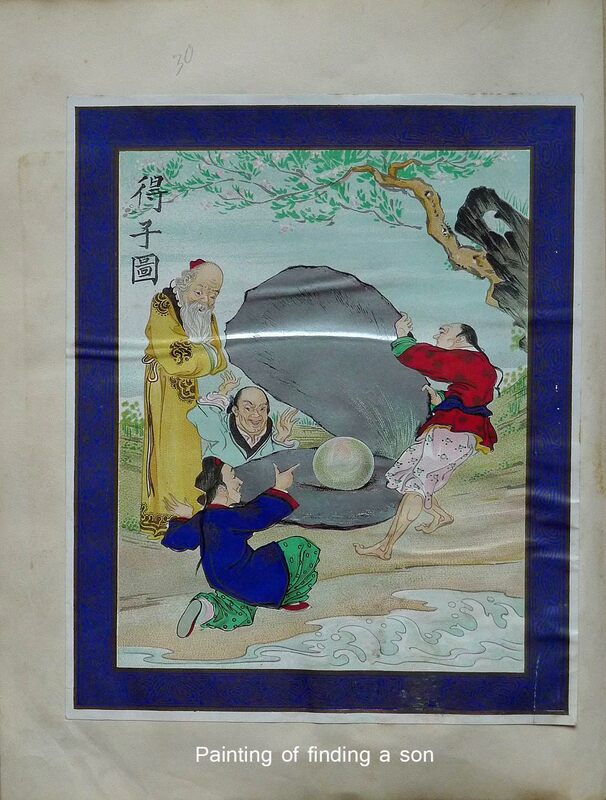 The merchant’s goal was to have the collection on display at a museum and he entrusted my help in finding a suitable home for the collection. The Museum of Science & Industry was selected and approved by the merchant but they did not want to take the whole collection because of cost and preservation issues. Unfortunately, the merchant died before I could complete the cleaning of all the stamps and the Museum completely bypassed me in making a selection of which stamps they wanted to acquire. Maybe they thought I would be biased and only suggest to them stamps which I didn’t want but for whatever reason, they made a selection which was far from ideal. 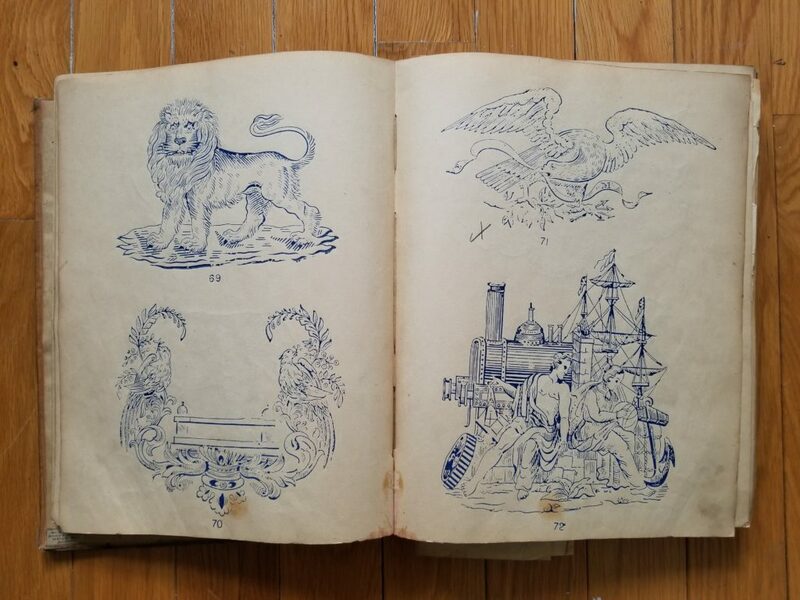 I bought the remainder of the the collection from the merchant’s sons and found that I had one color stamps which matched up with corresponding color stamps the museum had picked. The museum had also not realized that some stamps they left behind were of great importance due to their age, the type of image or the maker. It was a sad end to a long process but I thought it was right to make a selection of stamps which completed the museum’s and let them acquire those from me. The merchant’s sons were so upset at the way the museum acted that they refused to donate the company archives in protest. 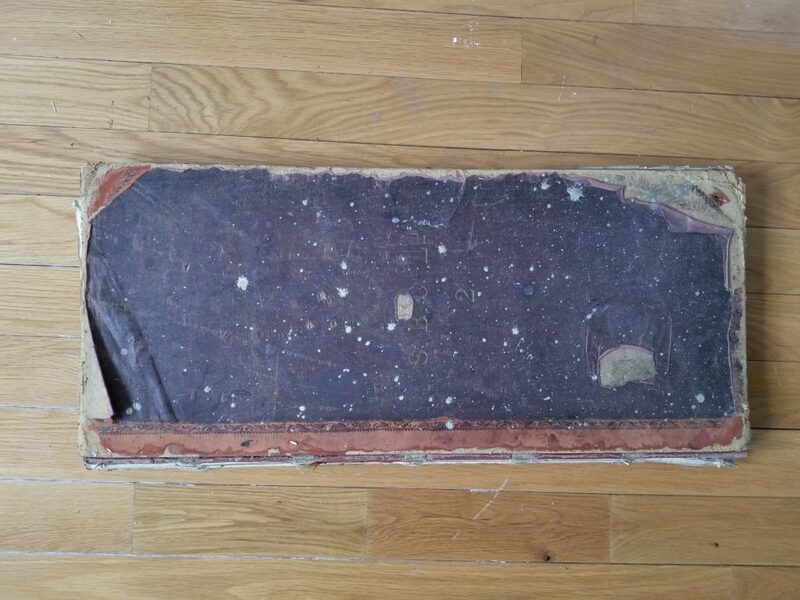 This story seems bitter/sweet but I had to contend with a lot of unfortunate circumstances, great finds and intersting characters while I was collecting. 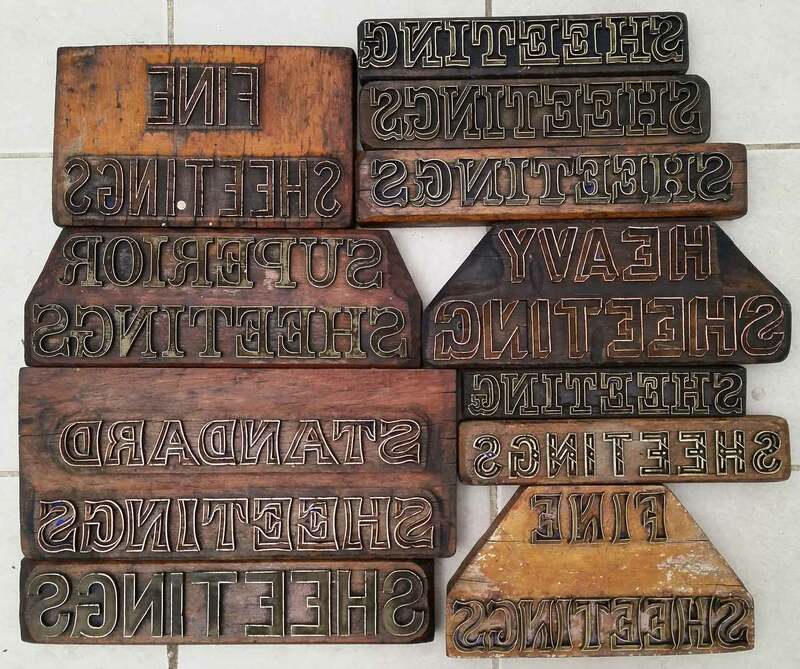 There was Frank, the Asia House janitor, who would hoard any stamps he found in a large cabinet in the sub-basement and hated if I got any before he got to them. There were the demo guys who would risk getting fired by stealing lead and copper from construction sites but would throw out all those historic items and jackhammer ornate tiles off walls without thinking twice. There were the countless times that I was “2 weeks late” and all the stamps had been burnt or sent to the dump. The saddest of these was at Star Vale bleachworks in Horwich, near Manchester. 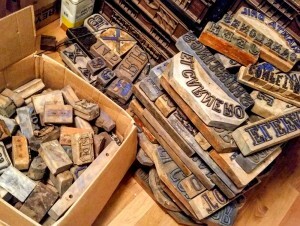 I had already been there and done some rough prints off their stamps but they had about 10 typeface chests about 6 feet high, each containing about 30 trays of handmade lettering stamps. All of it was thrown on a bonfire when the bleachworks closed. There were people who helped me collect and there were others who would rather throw things in a dumpster rather than let me have it – presuming I was some kind of dealer who would make a fortune out of them. There were the staff of ETP, the last packing firm in Manchester, who were so happy that someone was going to photograph their skills before they shut their business. 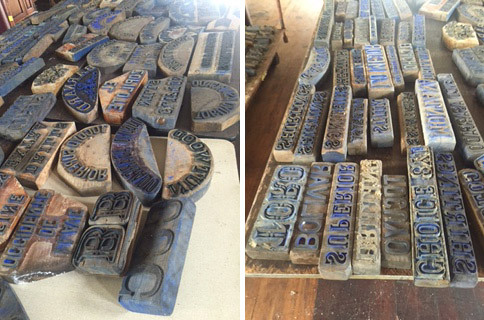 There was even the last stampmaker who excitedly told me at his home how artists at Shaw & Latham learned their skills and made the stamps. The reality is that I had a golden age of collecting these objects from 1987 until 1995 when everything was gone from the warehouses. I collected a lot and missed saving a lot but have never sold a single stamp. 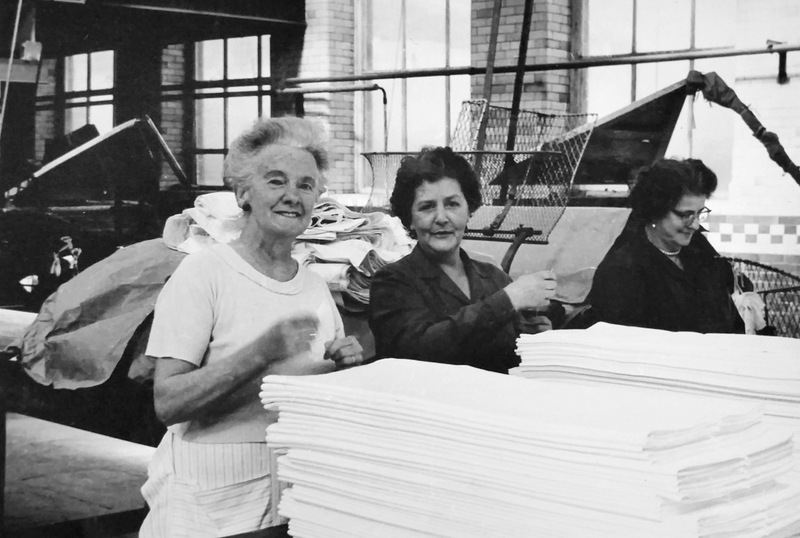 The collection is unique and I am glad that all those hours spent rummaging around in sooty old buildings and talking to anyone who wanted to tell me about their lives in the Manchester fabric trade has led to me being able to retell and illustrate their stories and achievements. The collection was once dismissed as irrelevent “commercial art” by someone who I showed the tickets to at Manchester City Art Gallery. 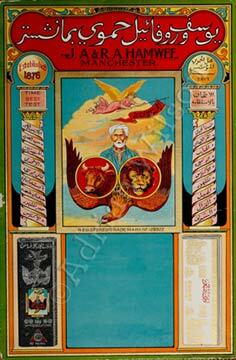 I believe that Manchester textile merchants used the biggest variety of ethnic art ever amassed in their day to day business. 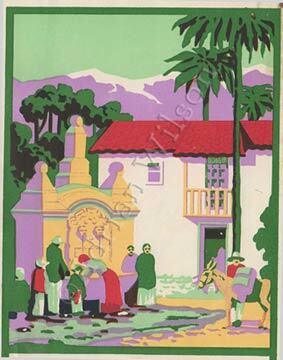 It may have been used commercially but is certainly was Art. 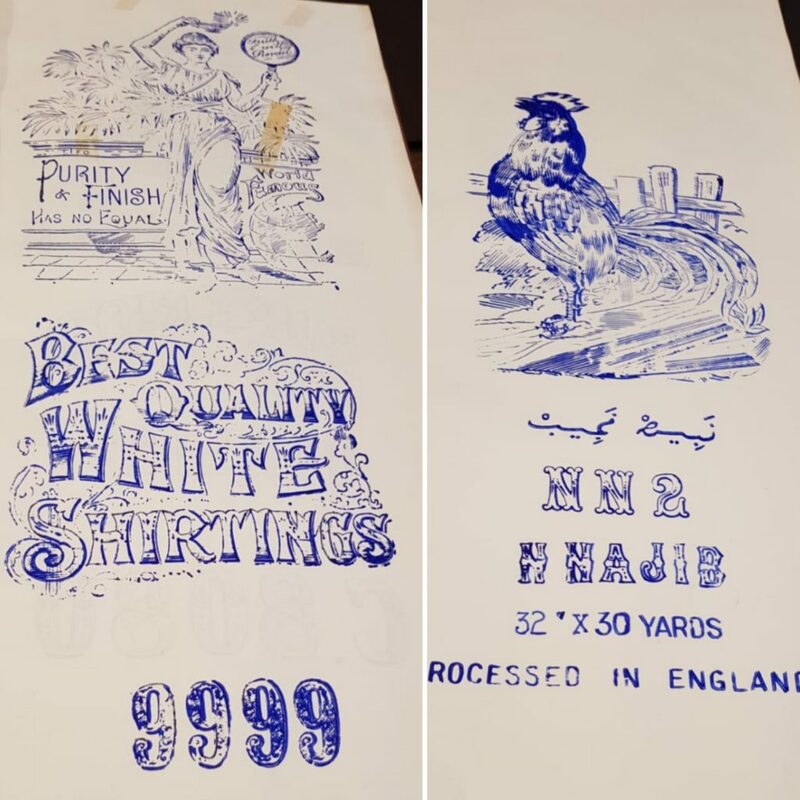 The Manchester City Art Gallery now has a set of shipper’s tickets on display, though of course they are misdescribed as “Bale Labels” and are by the famous poster artist E McKnight Kauffer, rather than one of the unnamed Manchester artists but at least its a start…. Oh, and here’s an E McKnight Kauffer ticket of my own, plus another 2 from unknown Manchester artists. 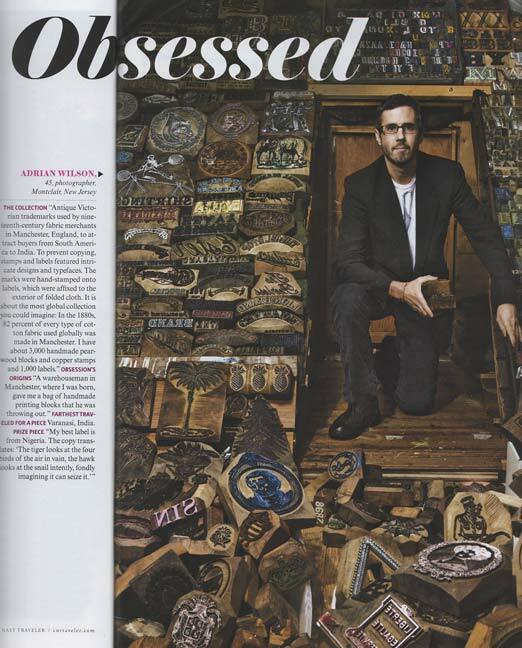 I appeared as one of the “Obsessed” collectors in the February 2010 issue of Conde Nast Traveller, stumbling over piles of the stamps. 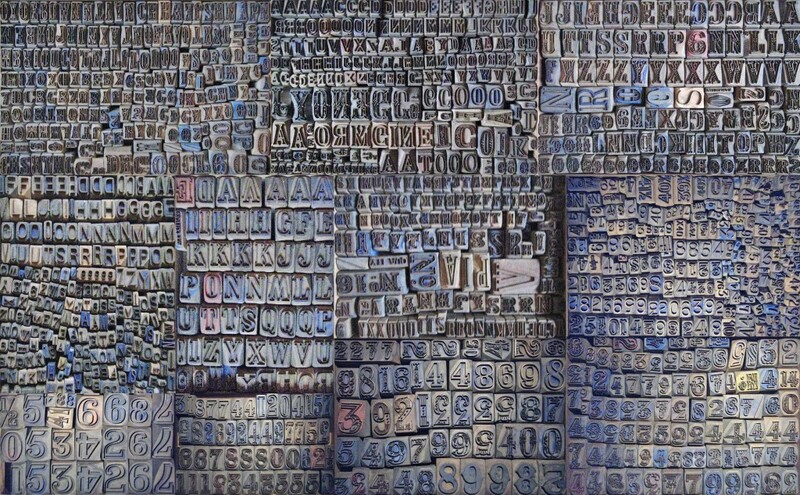 I can assure you that the stamps are not normaly treated that way but it did make a splendid image!